Are you in the real estate market to buy a home or property? FlatPrice.ca puts money back in your pocket with our Cash Back service, giving home buyers up to $2500.00 cash back on closing. FlatPrice.ca’s Cash Back buying service is straight-forward and simple, giving home buyers cash back when they use our model to buy their home or property. We put money back in your pocket – and YES, you can buy a home and make money! Contact us to find an agent near you. Please Note: For Sale by Owner (“FSBO”) contracts and sales are not eligible for this cash back service as there are no posted commissions paid to agents on private sales. Cash Back Reality: Thinking About Buying a Home? FlatPrice.ca wants to represent your home buying purchase so much that we pay you for the privilege. Our cash back reward program for home buyers offers services of an experienced’ buyer’s agent and puts cash back in the home buyer’s pocket. If you’re selling before you buy, use the cash back guarantee to further reduce our already attractive selling commissions! No gimmicks. A home selling contract always states the total commission to be paid by the seller, as well as how much the home seller’s brokerage will pay to the cooperating buyer’s agent. This means the commission paid by the seller compensates both the seller’s agent and the buyer’s agent. 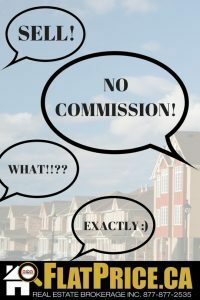 Home buyers are not asked to pay any portion of real estate commissions. Recent changes to the Real Estate Act allow licensed agents to pay cash incentives to non-licensed individuals. If a home buyer purchases a home using a licensed agent, the brokerage is permitted to pay the buyer as an incentive to increase business. The payment is treated as an expense to the agent, but it’s tax-free to the home buyer! When you purchase your home with a FlatPrice.ca agent, you will receive up to $2500.00 of the agent’s commission earned upon closing. You receive the cheque when you take possession of your home. Our buyers’ cash back reward program has no conditions or fine print. Home buyers are not restricted or penalized with time limits or home tour requirements prior to purchasing (please see our packages for more information). You will never be asked to sign a buyer’s brokerage agreement or be contractually committed to a purchase. Use FlatPrice.ca to buy your next home and get cash back, no strings attached.